Join the Ali Center in welcoming this month’s Daughter of Greatness, Roula Allouch. 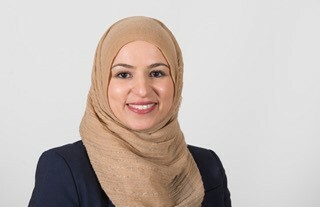 Ms. Allouch currently serves as Chair of the National Board of Directors of the Council on American-Islamic Relations, the nation’s largest civil rights and advocacy group for the American Muslim community. She is a member of the board of directors of the American Bar Association’s Rule of Law Initiative and serves as a Kentucky delegate to the Association’s House of Delegates. Ms. Allouch has previously been named a Rising Star by the Cincinnati YWCA and featured in Cincinnati Magazine’s “The Future of Cincinnati: Ones to Watch” issue.